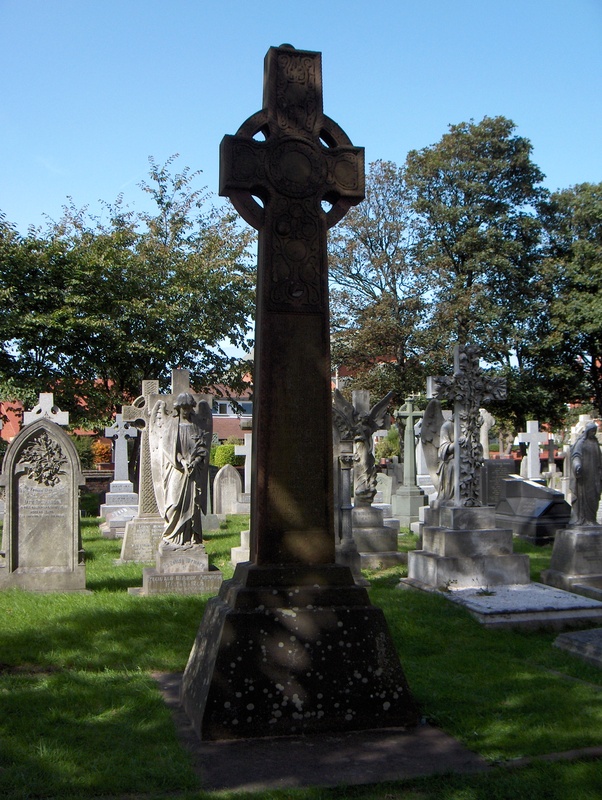 The lifeboat memorial where five crew men of the Laura Janet are buried at St Annes parish church. The Mexico was a large barque from Hamburg which set sail from Liverpool bound for Guayaquil in Ecuador on the night of 9th December 1886. Not long after setting out, it signalled that it was in distress to the south-west of Lytham. At around ten o’clock the Lytham lifeboat, Charles Biggs, was launched in a moderate west-north-west gale with a very heavy sea. At eleven o’clock that same night the lifeboat from Southport, the Eliza Fernley was also launched and managed to come within about twenty yards of the Mexico, which was breaking up, but a huge wave struck the lifeboat, tipping her upside down and all her crew were washed into the raging sea. At around half past ten the St Annes’ boat, Laura Janet, had also set out, under sail, but she was quickly swept away. The boat from Lytham eventually managed to reach the Mexico, plucking the captain and crew from the sinking vessel and bringing them safely to shore. Coxswain Thomas Clarkson and his crew then went back into the raging sea to try to save the crew of the St Annes boat. But they were too late. All the crew of the St Annes boat drowned that night. A total of twenty-seven lifeboatmen died at sea in the Mexico disaster. Charles Tims age 43, Reuben Tims age 30,Thomas Bonneyage age 35, James H Dobson age 28,Thomas Parkinson age 28. The memorial is also inscribed with these words from the gospel of St John: Greater Love Hath No Man Than This. That A Man lay down His Life For His Friends. The Laura Janet memorial at St Cuthbert’s, Lytham. James Bonney age 21,Nicholas Parkinson age 22,Richard Fisher age 45, Oliver Hodson age 39, James Johnson age 45, John P Wignall age 22,William Johnson (coxswain) age 35. 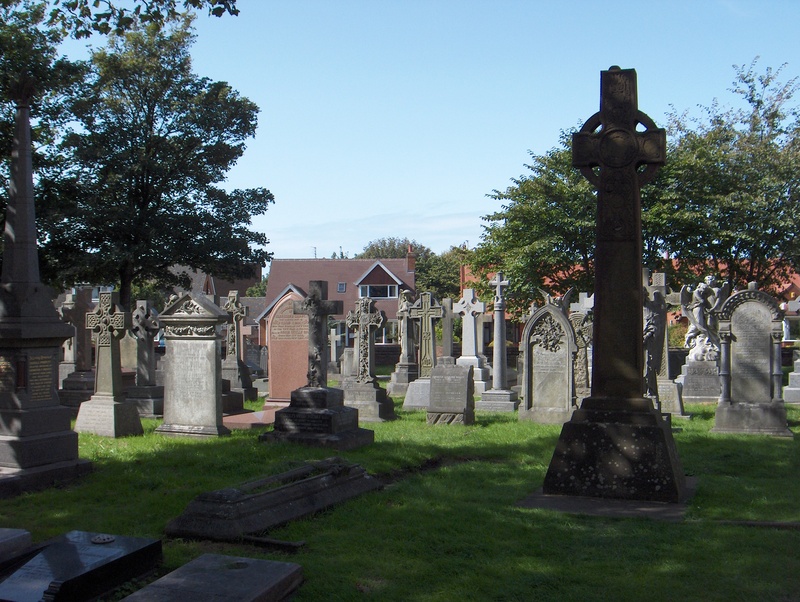 It also mentions James Harrison age 19 who is buried in Blackpool Cemetery. 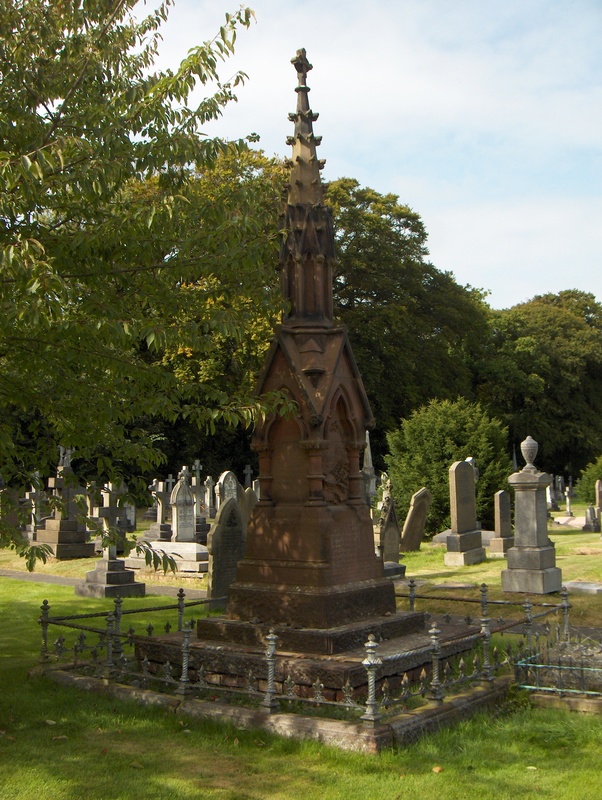 The grave that adjoins the memorial at St Annes is that of Sir Charles Wright Macara. He was born in 1845 at Strathmiglo in Fifeshire and was the eldest son of Rev William Macara who was a minister in the Free church of Scotland. After being educated by his father and at school in Edinburgh he began work, at the age of sixteen, for a firm in Glasgow whose business took him on visits to Manchester where he subsequently worked as a representative of Cox brothers of Dundee. In 1880 he became a partner in the firm of Henry Bannerman and Sons and acting as the managing director from 1884. And in 1875 he married Marion, who was a granddaughter of one of the founders of the firm. In 1884 he fought a strike by the Bannerman workers but became associated with the rights of both workers and employers. From 1894-1914 he was president of the Federation of Master Cotton Spinners’ Associations and in 1899 was instrumental in the formation of the Manchester Cotton Employers’ Parliamentary Association. During the cotton strike of 1892-3 he resisted the workers’ wage demands but also opposed employers’ attempts to crush the union and as chairman of the Manchester Master Cotton Spinners’ Association he was largely responsible for the Brooklands Agreement of 1893, which established new guidelines for negotiations during labour disputes within the cotton industry. 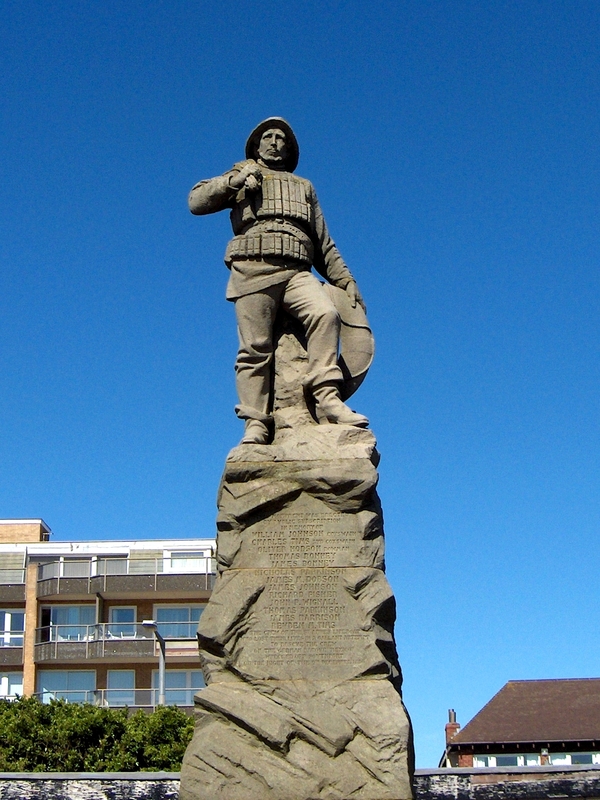 The lifeboat memorial at St Annes. to help the bereaved families of the Mexico disaster, including contributions from Queen Victoria, the German Emperor and the Port of Hamburg, were received he became the chairman of the Relief Fund. Following this he founded the Lifeboat Saturday Fund. The first event was held in 1891 in Manchester when thirty thousand people attended and five and a half thousand pounds was collected. The Fund spread to the rest of the country and became an annual event and his wife Mrs Marion Macara helped set up the Ladies Auxiliary Committee which led later to the formation of the Ladies Lifeboat Guilds. Charles Macara revolutionised charity fundraising and his ideas still raise money for the Royal National Lifeboat Institution. Charles Macara was created a baronet in 1911. 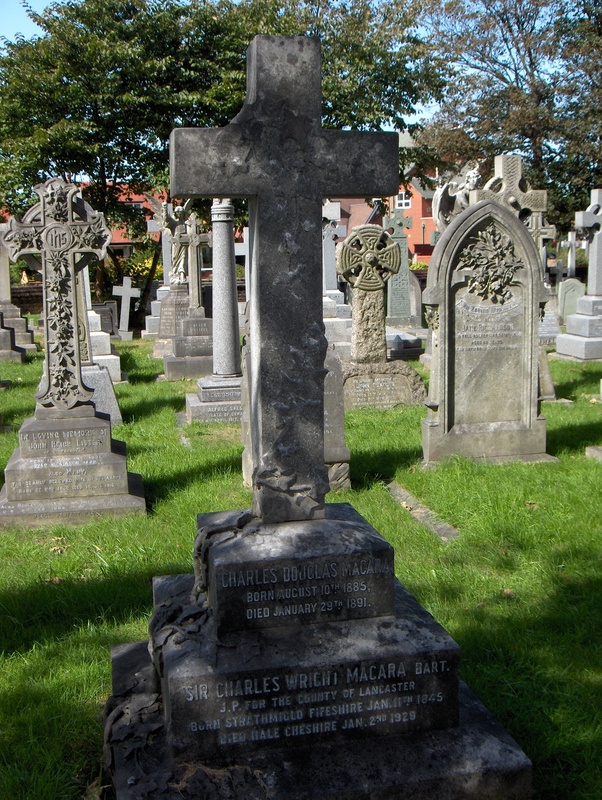 He died at his home at Hale, Cheshire on the 2nd January 1929, but was buried at St Anne’s.